Campervan hire New Zealand: East Coast Campervan Roadtrip. It may be still rainy and cold in New Zealand but the summer holidays will come and the campervans will sell out quickly. It pays to book early and be prepared for your New Zealand trip. 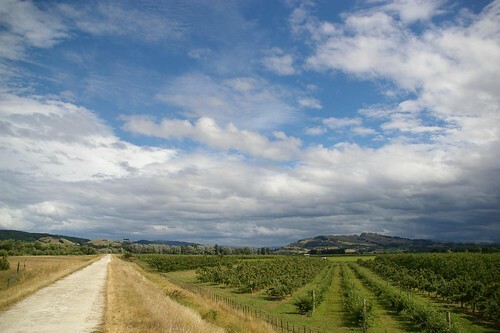 One of the great thing about New Zealand is that it doesn't become to crowded and unpleasant in summer. You can stiol find places where you'll have a lovely relaxed stay. The East coast of the North Island is as beautiful as it is fun. From one kiwi (New Zealander) to a non-kiwi, you can hewar the places to go that maybe you may not hear about otherwise. Pick up your choice of Campervan in Auckland, stay a night there if you want, or head down south-east towards Tauranga/Mount Maunganui. The drive takes you south on the Motorway before turning off on state highway 28 towards tauranga. Drive through small NZ towns like Paeroa. Make sure you stop here for a look through the antique shops and opportunity shops and to sample some LnP - NZ's favourite fizzy drink. Mount Maunganui is one of the country's best holiday spots. Surrounded by sparkling waters, you can swim almost anywhere, and dotted with mountains you can walk or climb and take in beautiful views. Mount Maunganui itself is of course a beautiful walk around or up as is the Papmoa Hills. The beach is popular with surfies so bring your board or take some surfing lessons, hire a kayak on the harbour side of the town or chill out in one of the many cafes or bars , Major Toms bar being my favourite bar and Tay Street Cafe being my preferred cafe. Follow the local kids and jump off the wharf or eat some fish and chips on the beach. 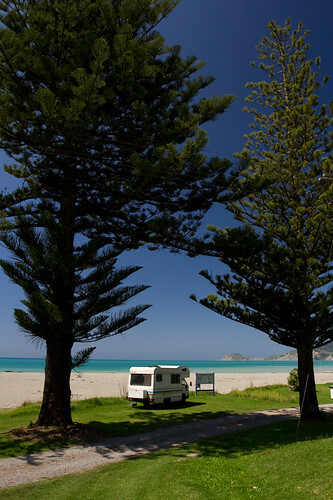 You can park the camper and spend the night at Mount Maunganui Beachside Holiday Park, Cosy Corner Holiday Park or go a little further down the coast to Papamoa Top 10 holiday Park. Once you've had your fill of Mount Maunganui or want something a bit quieter, jump on the road and head out to the East Cape. You'll notice a change in scenery as you head out onto the cape. The seas are rougher but still beautiful, the beaches that come so near the road are strewn with drift wood and rivers are opening up the whole drive around. The houses are more humble as are the towns, don't be surprised if you see a bare back horse rider. As you head towards Gisborne, you'll want to break up the trip and stay somewhere along the way. Stop for a break at Pacific Coast Macadamias and sit next to the trees with a bite from the cafe. Have a look at the beautiful church after Papatea Bay and stop for an ice cream at Waihau Bay. Hicks Bay is another beautiful bay to spend some time at. Te Araroa Bay has a pretty camp ground set among big old trees and along side the beach. It is also home to the oldest Pohutukawa tree and has a lighthouse that you can follow the track to. Take your fishing rod or a handline with you because the a bush walk around Haupara Point leads to some excellent rock fishing. Tokomaru bay is before Gisborne and is a large stretch of white sand, washed with clear blue waters. A very picturesque place to stop. At Tolaga bay as you keep following State Highway 35, you'll find the Tolaga Bay Pier, New Zealand's longest pier. It's old and there'll be lots of Fisherman at the end. There's a campervan park there, Tolaga Bay Holiday Park, where you could spend a dreamy night. Lay on the beach and enjoy the views. There would be many places along the journey where you can free camp, but to be safer try find a camp ground. They'll be dotted around the place frequently and would not usually be full. Be sure to stop off at beautiful rivers for a dip in the fresh, clean waters, most that you can see from the road would be accessible. Take your time on the journey, there's so much to see. Gisborne is a surfers town, located on the curve of the east cape. It's the first city in the world to see the sun each day and is home to many painters, poets, potters, attracted by the relaxed life style. Go for a surf, or learn how to surf, walk along the teal waterways, discover the Maori culture at the historic sites and last but not least ride the Rere rock slide. 10 minutes from Gisborne, stay at Tatapouri By The Sea, or stay at Waikanae Beach Top 10 Holiday Park. 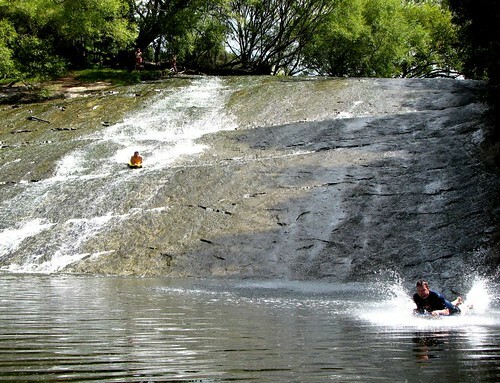 Now, Rere Rock slide is a must do, but you'd reap the most benefits if you have a boogie board, inner tube or even a piece of cardboard. 50 kilometres from Gisborne on Wharekopae Road is this natural rock slide that forms part of the river.While you're there, walk around the Rere Falls, swim in the swimming hole and picnic in the picnic area. It'll be a fun day, be sure of it. Continue the road trip 2 & 1/2 hours down the coast to Napier. Napier has a huge stretch of pebbled beach and has a delicious blend of history, culture, wine and local cuisine. This "art deco" city lets you take a guided walk around the city, has a fun aquarium to visit and the best yet, bike tour of the wineries. So much fun and pretty well priced. If you can handle the smell (a bad one) located at the nearby Cape Kidnappers, you can see the biggest Mainland gannet colony in the world. The scenery up there is worth it though if you don't think the birds are. Stay at Waimarama Seaside resort, or Bayview Holiday Park. The East Coast journey for me comes to an end here. But on your way back to Auckland stay and explore Taupo and Rotorua. This geothermal area offers a lot for the tourist in terms of culture, sight seeing and fun activities. Go where you want and do what you want but make sure you get a campervan for your journey. They give so much freedom for where you can stay, you could end up in prime real estate beach locations for the night, and they save you a lot of money on expensive accomodation. You can cook or snooze where you want, just pull up aside a nice beach, crank the stove or brew a coffee and you're living the dream. Hire a Campervan here and find some great deals on rates. This trip will be unforgettable.